The two GPU powerhouses are locked in a battle for the best graphics processors -- but only one of them is using its tech to transform new markets. Advanced Micro Devices (NASDAQ:AMD) and NVIDIA (NASDAQ:NVDA) dominate the graphics processing unit (GPU) space, taking 29.5% and 70.5% of discrete desktop GPU market share, respectively. Both companies are benefiting from the increasing need for better GPUs for gaming, more image and video processing, virtual reality, and (at least for NVIDIA) GPU-powered data centers. Investors in both companies have likely been pleased with returns from the chipmakers as well, as the companies' stock prices have skyrocketed over the past 12 months (see below). Though while these rivals are each claiming their own stake in the GPU space, NVIDIA appears to have clear long-term advantages over AMD. NVIDIA currently dominates the GPU space, and has done so for quite some time. The company's high-end graphics processors can't be topped (for now) by AMD, and its market share of 70.5% far surpasses AMD's share of just a third of the market. NVIDIA earned just over 62% of its total revenue from sales of its GPUs for gaming in the most recent quarter, but the company is also making huge strides in other areas. For example, NVIDIA is using its GPU prowess to create on-board driverless car supercomputers (called Drive PX 2) to power self-driving vehicles. Drive PX processes all of the visual information from driverless car cameras, and then uses it to give the car situational awareness. NVIDIA grew its automotive revenue by 37% year over year in fiscal Q4 2017, and the company's opportunities in the space should continue to grow, especially considering that Drive PX is already being used by 80 automakers and automotive suppliers. The company is also tapping into a $5 billion-plus opportunity in artificial intelligence (AI) by using its GPUs to power data centers. More and more technology companies are looking to the image processing capabilities of GPUs to power AI processing and NVIDIA is already benefiting. In the most recent quarter, NVIDIA saw its data center revenue spike by 205% year over year. AMD may be in the shadow of NVIDIA's GPU market share right now, but the company certainly deserves some credit for the position it currently holds. 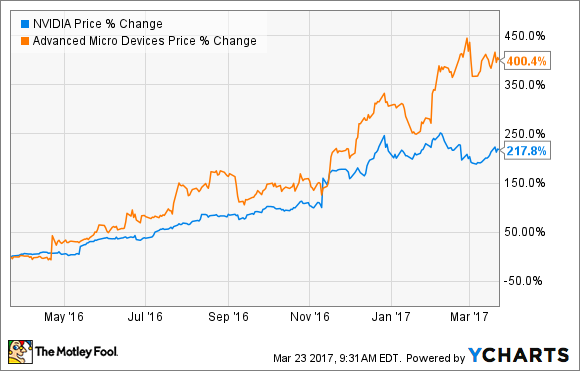 Some investors may remember that as recently as 2015, NVIDIA held more than 82% of discrete desktop GPU market share and AMD's share had fallen to less than 20%. Since then, the company has aggressively tackled the midrange GPU market and earned back some of its discrete desktop market share. And AMD is aiming to make some more gains on NVIDIA later this year when it releases its new Vega GPU architecture, which is aimed at its rival's high-end GPUs. AMD has been talking up Vega for quite a while, and the graphics processor is expected to take on NVIDIA's GTX 1080, though AMD hasn't revealed detailed specs of the unit yet. Unlike NVIDIA, AMD has a strong position in the semi-custom chip space as well, supplying GPUs for gaming consoles. But the company isn't doing near as much as NVIDIA to advance its GPU uses outside of gaming. AMD's posted strong revenue growth recently, with the company's sales up about 87% year over year in Q4 2016, and up 93% from the full year 2015 to 2016. Even with AMD's stock price growth, its gains in GPU market share, and the potential benefits from its upcoming Vega processor, the company still can't match NVIDIA's dominant position in the gaming space and its massive opportunities in AI, data centers, and driverless cars. AMD might be a formidable opponent in the strict GPU sense, but there's no comparison when it comes to NVIDIA's potential in new markets outside of traditional gaming.